Infinite Art Tournament: Element of the Month: Chromium! With a name like Chromium, you just know that Element #24 is going to be all colorful! But then you are disappointed to find that it is yet another silvery metal-colored metal. Yet it turns out that various chemical compounds of Chromium actually ARE very colorful. In the 18th Century, a bunch of pigments based on Chromium were first discovered and then manufactured, leading to something of a revolution in the art paints biz. (This is something that one of the Reading List books, Bright Earth, discussed at some length.) The one people noticed first was something called "Siberian red lead", which as the name suggests also contains lead and is, well, red. There's also a chrome yellow and a chrome green, the latter being apparently the ninth most abundant compound in the Earth's crust. Who knew? So, Chromium does a neat trick. It reacts with Oxygen, which as you may remember is fairly abundant in the Earth's atmosphere, to create an extremely thin but durable and inert surface layer. You know how people used to be all about the chrome on their cars, before all the bumpers and what-not got encased within the exterior shell? Well, the chrome stayed shiny because of that surface layer. 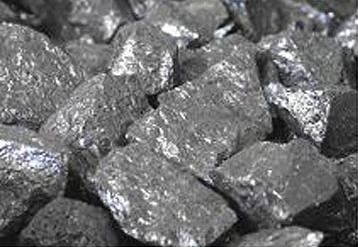 That's why the main use for Chromium in the human community, these days, is in an alloy with steel that helps it resist corrosion and discoloration. It's called -- wait for it -- stainless steel! Yep! Stainless steel is steel, but with around 12% Chromium thrown in. In addition to its presence in the cutlery, Chromium is important to you because you can't properly metabolize without it. However, you don't need much of it, and since there's actually quite a bit of it floating around -- it is the 20th most common element on the planet -- it is generally thought to be impossible to have a medically problematic Chromium deficiency. So relax. On the other hand, too much Chromium -- like so much other stuff -- is bad. Some forms and compounds are toxic or carcinogenic. Don't roll in the stuff. Chromium was first isolated by Louis Nicolas Vauquelin, a prof at the University of Paris. (He's also the guy who isolated Beryllium, although I didn't mention it at the time.) Vanquelin seems to have been a bit of a chemical whizbang, and was a highly prolific writer. He published many hundreds of articles over the course of his academic career. Yet he perished all the same, in 1829. Wait-- you mean to say that academic publishing isn't going to keep me forever young and healthy? How tragic! I didn't realize that I had to brace emotionally for this kind of trauma in my Element of the Month reading! Jennifer asked just the question I was going to ask--perished all the same?!!! !--only, admittedly, she's got a lot more riding on the answer. Way to wring human drama out of the Element of the Month, M5K!